I recall taking deep breaths and trying to regain my focus on the way to the restaurant. The stop sign was octagonal. The intersection was perpendicular. The zebra stripes were parallel. By the time we got to Landon's, Dorothy appeared normal to me except when I looked into her eyes. They were shaped like green, sparkling stars. The maitre d' led us to a round table by a square window. The prospect of sitting there small-talking churned my anxiety so I planned to order quickly. I hoped if I was occupied with my meal, it would relax me. As soon as we sat down, Dorothy said something I wasn't expecting: "I'm really Hungary." Then she shook her head and frowned. "I have to make a confession. I have Cartographer's Condition." Apparently I made her a little nervous, too. We were a good match. Knowing Dorothy had her own disorder made me less self-conscious about my own. I remained relatively calm most of the evening except for continuing to see Dorothy's eyes shaped like stars. I recall it began snowing during dessert, and the flakes seemed to float in rhythm with Moonlight Sonata playing in the background. Funny how details drift back. Everything was wonderful - even though I ordered a slice of apple circle instead of pie because I was already thinking about our first goodnight kiss. I took it as an encouraging sign when Dorothy asked for a fruit plateau instead of fruit plate. Dorothy and I got married about a year later. 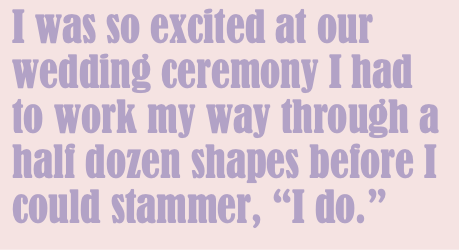 I was so excited at our wedding ceremony I had to work my way through a half dozen shapes before I could stammer "I do." Just as our conditions had been part of us individually, they became intrinsic to our life together. In a fit of passion Dorothy would cry out "Jamaica" or some other tropical island. To this day, I can't see a travelogue about the Caribbean without getting a little turned on. Once we were arguing about... I don't even remember... something stupid. She said I was a real Yangtze, and I called her a trapezoid. We both burst out laughing. Our syndromes kept more than one disagreement from spinning ugly. Time went so fast. Before I knew it, we were beaming down on our newborn son after bringing him home from the maternity ward. Neither of us even tried to speak. 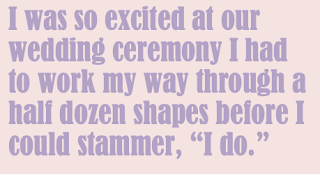 We both knew we'd be able to blurt out only nonsensical strings of geometric forms and map lingo. Later Dorothy told me that, as she watched Dicky, it was as if she were looking at the whole earth from space. I saw a spinning sphere myself. I couldn't believe how well-tuned we were at that moment. And still were all those years later when we held our infant granddaughter. But no matter how much we were in-sync and comfortable with each other, I always felt a current of excitement when I was with Dorothy and never tired of gazing into her star-shaped eyes. It was shortly after our second grandchild was born that Dorothy dreamt the Alps were in Asia and the Mississippi flowed north. We had a chuckle about it. The next night, she woke me up mumbling in her sleep. Something about Atlantis surfacing off the coast of Maine. Strange, but nothing to be alarmed about. So we thought. A couple weeks later, Dorothy and I were having breakfast when she gripped the table and said she could feel the earth's crust shifting. In hindsight, I think her body was using her syndrome to warn her something was wrong. We decided to take a watchful waiting approach. During the next month or so, Dorothy didn't experience anything unusual. At least not that she told me about. I'd almost put it all out of my mind when, one morning over coffee, she said she'd dreamt the Gobi Desert was metastasizing across China. Dorothy's doctor ordered a battery of tests. The results weren't what we were... a nonagon has nine sides... a dodecagon, twelve... hoping for. The nurse leaves Dorothy's meal anyway. I suggest to Richard that he go home and get a little rest. He agrees after some coaxing. Before leaving, he kisses his mother on the forehead and says, "Canada polygram." "I love you, too, Dicky," Dorothy whispers. It isn't long after Richard goes that Dorothy looks at me, tries to smile, then drifts away. I realize it's the last time I'll ever see the stars that were her eyes. The painting is square. The shade is cylinder. The clock is round. And tectonic plates are shifting under my feet. The couple were disorder compatible. Well tuned to each other. Fun use of language. Thank you, Jack and Bruce. Really enjoyed this highly original, playful piece. I particularly like the repetition of the images from the start of the story at the end, like a piece of music restating the initial theme, neatly tying everything together, plus a superb last sentence. This story is entertaining and focused, not a word too many. Given the rise in dementia, etc., the story suggests to me that such conditions are just part of life, and may really be all right. Thanks very much for your comments, Gareth and Patrick. a very interesting and original story. food for thought and a lesson for many here; don´t judge a book by its cover etc. Thanks for your observation, Mike. Great story - concise, sad, funny, and complex. Conveys so many layers with so few words. I love the message that common ground can be attained even when people view the world through vastly different perspectives. Thanks for your nice comment, Ronald! This story has everything, humour, pathos and integrity. Thoroughly enjoyable, Dave. Aaawww it's sad but wonderful. Nice work! !